Elder Sign makes a decent fist of providing a Lovecraftian adventure experience but its inherent randomness undermines it in both theme and mechanics. That’s why we gave it only two and a half stars in our review. As always though, that’s just our opinion. That and fifty pence will get you a cup of coffee, as they say. Don’t they? They say something like that. Is it fifty pence for a coffee? Do people buy coffee any more? What’s with this Poke man thing I hear all the kids talking about these days? It doesn’t matter what we think. There are a hundred review sites out there with thoughtful critiques of every game under the sun. The question that we’re uniquely positioned to answer is whether or not you can play it if you want. Is it going to banish inaccessibility to the hell of fire and ghosts, or is it going to summon an unplayable Cthuluesque monstrosity into your living room? Let’s find out. Yeah, you can probably tell these apart. Those with Protanopia may find the dice a little awkward to work with, since the red dice is very difficult to distinguish from the green dice. Other categories of colour-blindness should be fine, although those with Deuteronopia may find there’s less discrimination between the red and yellow dice than they might like. Okay, that might be a problem. Here, the situation is slightly reversed. 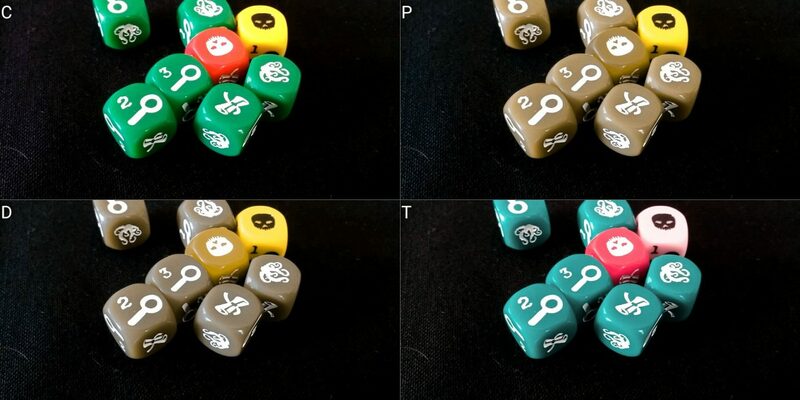 It’s easier for those with Protanopia to distinguish the dice than it is for those with Deuternopia, due to the slightly different colour palettes used. The yellow and red dice aren’t just extra dice – they’re actually more powerful. It’s important that you’re not rolling those when you are supposed to be using one of the plain old green ones. 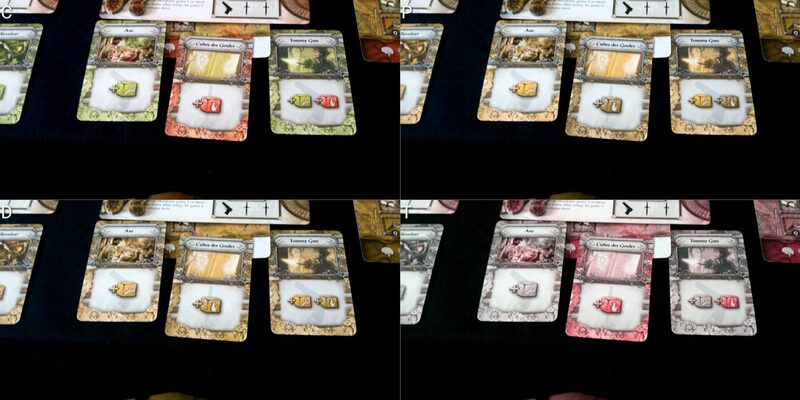 As such, this is a pretty substantial game-play issue for those with colour-blindness. Not only that, but the red and yellow dice are different from each other, not just different from base level green dice. You shouldn’t be rolling one when you need the other one. They’re non-standard dice too, which means you can’t just go grab a replacement of a more easily differentiated colour without constructing a lookup table. We’re going to offer a tentative recommendation here though. 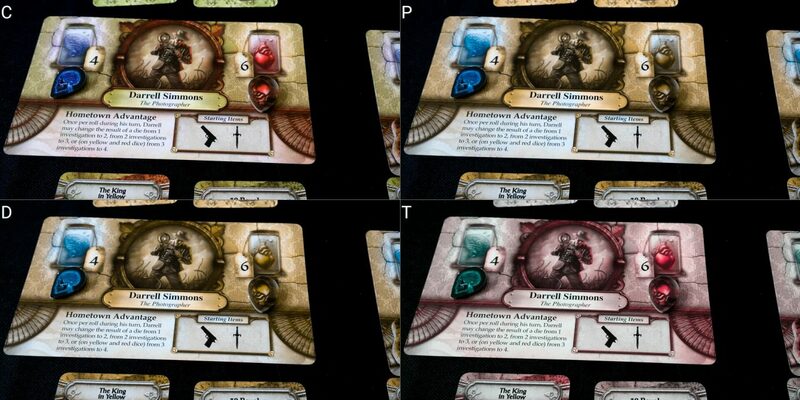 If you’re playing with someone that isn’t colour blind, it won’t be difficult for them to keep you on track, Since it’s a co-operative game there’s no cost to you indicating a difficulty in identifying which die is which. If you’re playing a solo game, you might find it difficult to keep track, but you can visually scan the offending dice to work it out. 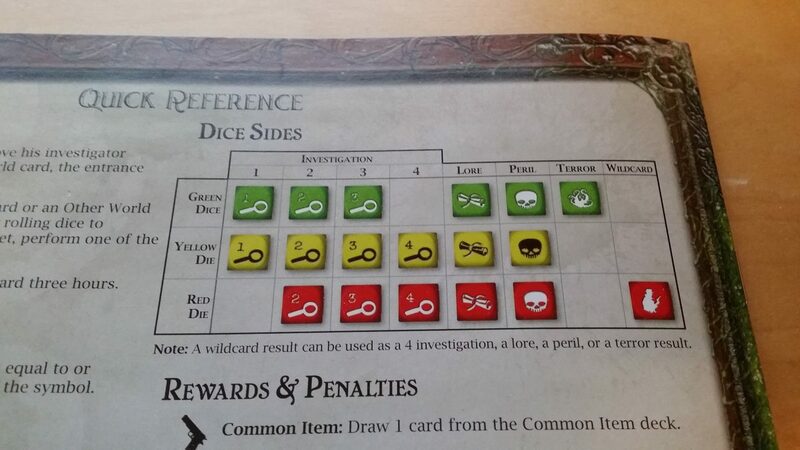 The red die has a wildcard and a four investigation symbol on it, and the yellow die has a four investigation symbol but no wild-card. It’s flow breaking, not game breaking. Text is reasonably well contrasted throughout, although some of the special ability text is in a rather small font. Differentiation isn’t bad as such, just not optimal. 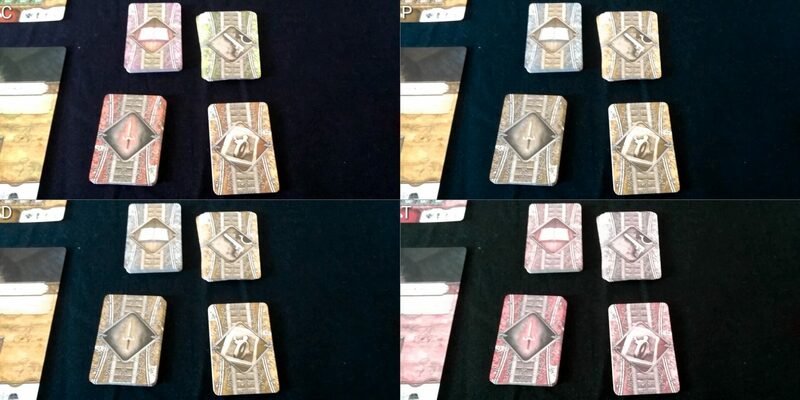 Many of the tokens in the game are absolutely tiny, especially the doom tokens and the investigator tokens. They look like ants from up here! 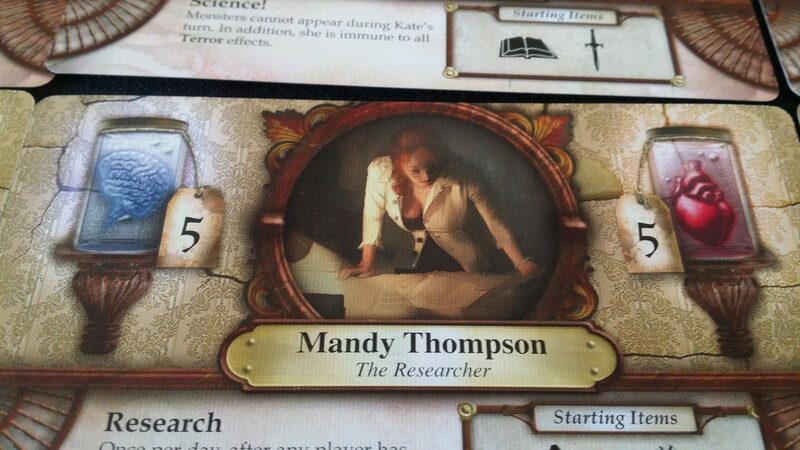 The investigator tokens are moved from card to card to indicate your position in the museum. This is also gameplay information you need to know about other players if you want to make use of their ability to offer assistance with dice rolls. Font choice on the adventure cards is a problem for flavour text, since it’s printed in a font that’s supposed, I presume, to mirror vaguely spooky handwriting. It’s both lighter than I’d like to see against the background, and difficult to read because of its ornamentation. Flavour text on monsters too is printed in a tiny font that might be difficult to make out, although this isn’t critical to play. It does have an impact on atmosphere though, and in a game like this atmosphere is important. It’s not real handwriting. You’re not fooling anyone. The dice used are non-standard, requiring the adoption of a lookup table if you want to use an accessible alternative. The back of the manual has a table showing the dice faces, and it could be used as a lookup table in a pinch. You can fashion this into a rudimentary lookup table by using only common implements you might find around the house. Otherwise you’ll need to make three lookup tables since each of the coloured dices have a different profile. Remember too that this is basically Cthulhu Yahtzee. You’ll usually be rolling six dice, and often making use of another two. If you have braille or oversized dice, you’re going to need eight to comfortably deal with the tasks at once, and you’ll need to be cross-referencing the lookup table as you do. It’s not ideal. Tokens are not very well differentiated in terms of their tactility. 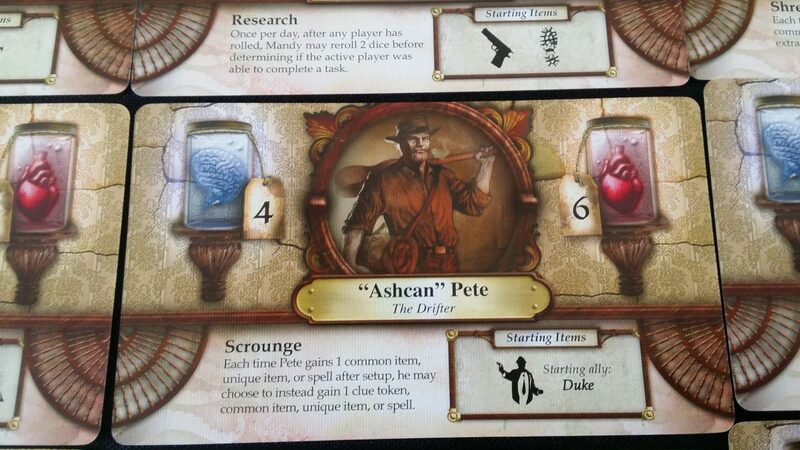 Each of the investigators shares the same profile, and the sanity/health tokens are all the same size and shape. Some of these have numbers printed on them too, to effectively create the problem of denominations of token you can’t tell apart by touch. At the end of each turn you need to move the clock on, but there’s no tactile clue as to its current value, or even its intended orientation. It’s a circular piece of cardboard, and you’ll have to pick it up to easily rotate the hand. It might be anyone’s guess as to what it ends up showing if you can’t make out the numerals. For solo play, we wouldn’t be prepared to recommend it at all. However, it’s ideally a game of co-operative play and as such it’s worth also taking into account that all of these issues are likely to go away if playing in a team with at least one sighted played. The flavour text is not long, and reading it aloud for the benefit of the table can be a powerfully atmospheric play choice. Since you’ll only have a few investigators, and only a handful of rooms in play at once, you can reasonably easily track who is where in memory. It’s easy to give a narrative overview of game-state too, such as ‘Mandy Thompson is dealing with the remains of the high priest, while Darrell is in the loading dock’. So, we’re going to offer a tentative recommendation for Elder Sign for those with visual impairments, but we do suggest it is likely most playable if you’re part of a team, and nobody minds taking on the role of the narrator for the table. The game doesn’t require any serious investment of thought in play, but it does need a considerable grasp of logical causality to appreciate what’s happening and why. That’s about it. Nothing about it is very challenging. Really once you’ve set the wheels in motion all you’re doing is rolling the dice for the outcome. It’s very similar to the basic flow of Galaxy Trucker in that respect. However, there is a reading level that’s required to understand how each of the powers work, how the terror effects should be resolved, and what special conditions pertain to mythos effects and rooms in play. Coupled to this, there is a fair amount of symbology used throughout that players are going to need to become comfortable with. There is though a lookup table provided on the back of the manual. That’s handy, because the rule-book is singularly badly structured if you want to make use of it as a reference guide. 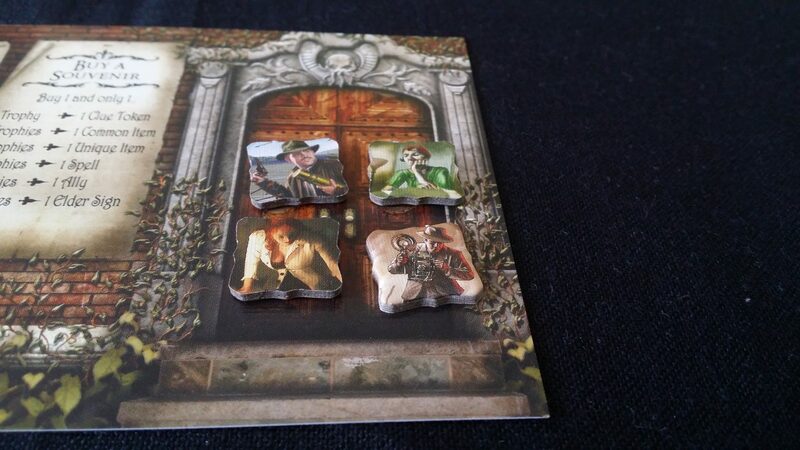 There’s quite a lot of conditional complexity that goes into making sure each of the rooms are set up correctly, such as with the different kind of monster tokens, the placement rules for these, and the impact that locked dice and monsters have on play. Some rooms have terror effects, or effects that trigger at midnight. Gate adventures enter and leave the game according to a different set of rules. Each of the elder gods against which you may be battling have different powers that trigger at different times. Some cards have individual tasks that must be completed before other tasks, others have tasks that must be completed in a specific order. Mythos effects too may change the way game rules work. For example, mythos cards exist that tell investigators they can ignore arrow order information on cards, or add additional terror effects to all adventures. Mythos effects may lock dice, or prevent the use of spells or equipment. It adds a lot of flavour, but it also adds a lot of conditionality on the way rules are applied. Fortunately there are few synergistic effects in the game and most items have a simple ‘do this to achieve this’ mechanic. That limits the escalation of cognitive complexity considerably. There’s not a lot needed in terms of memory management – everything tends to be in front of you all the time. The goals are clearly indicated as part of the laid out cards, and each special effect is documented somewhere in the game grid. Long term strategy is fairly simple, focusing primarily on maximising the efficiency with which elder signs are procured. As such, it places only a light memory burden on players. 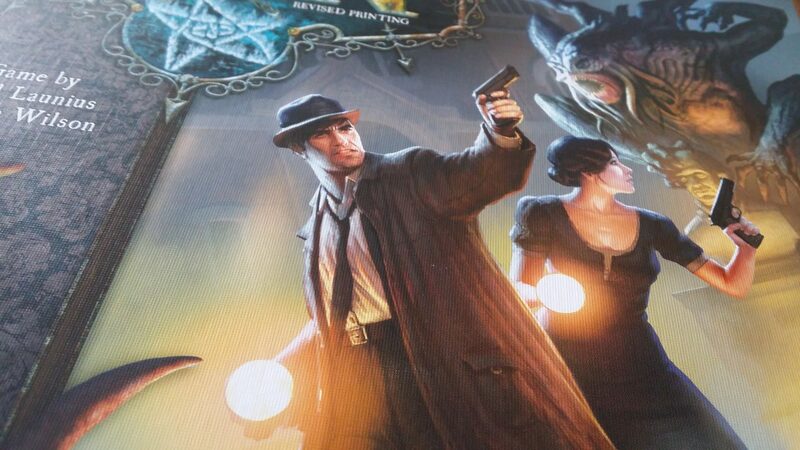 The game is likely playable with support for those with minor to moderate cognitive impairments, but we would prioritise many games before Elder Sign in that regard. As such, we can’t really recommend it, even tentatively, given the conditional complexity involved. The dice rolling is not complicated in and of itself, but you’d need to spend a lot of time explaining why things are happening and what the consequences of the rolling will be. In the solo game, the expectation too is that a player will control multiple investigators, with all the attendant increase in cognitive complexity that implies. For those with memory impairments only, we’re prepared to offer a recommendation. What memory burden it places is primarily in the area of symbols, and there are quick references available for these in the game documentation. As we discussed in the review, this game doesn’t so much have a challenge curve as it does a despair curve. Some cards are so sensitive that a single wrong die roll can be enough to lose you the entire thing. 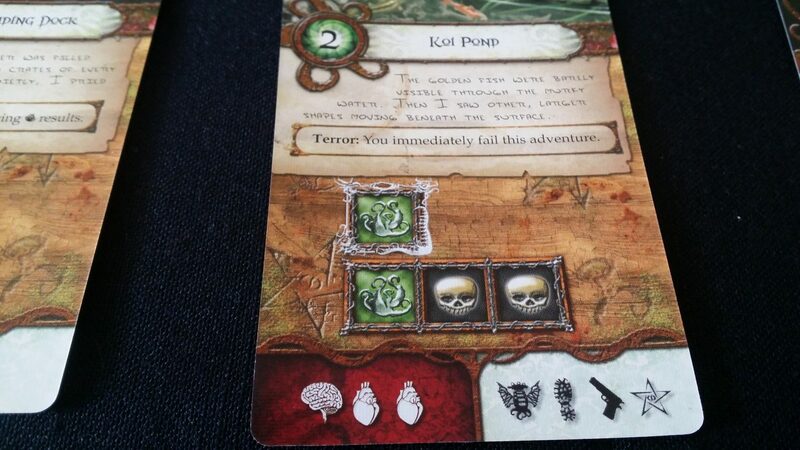 Consider the Koi Pond example – if you roll a terror die and can’t complete the task, you’ve failed. For any green die, you’ve got a one in six chance of rolling a terror. The first task requires a single terror. You’re probably going to succeed with the first task. Then you need to roll, in one round, a terror and two skulls. So, that’s a one in six chance and two further one in six chances. But now you’re doing it with five dice since you spent one. If you don’t get that exact roll, but you do get a terror, you’ll just fail instantly unless you’ve got re-rolls. Simply attempting the task can create performance anxiety. The cost of failure can be high for certain tasks too – they can spawn monsters, add to the doom track, or more. Terror effects can have consequences for everyone playing. You’re not to blame for that, because ‘lol roll better’ isn’t really actionable advice. But you’re still the one that made it happen. That means communal consequences for outcomes you have limited ability to influence. Not a great place to be if emotional accessibility is an important issue. Failures compound powerfully, too. A terror roll that spawns a monster might end up with dice being locked out of play. Dice being locked out of play may make adventures all but impossible, which can create more failures which can accelerate you along the track to your rapid demise. As with anything, if you can get into the spirit of it then it’s probably okay. 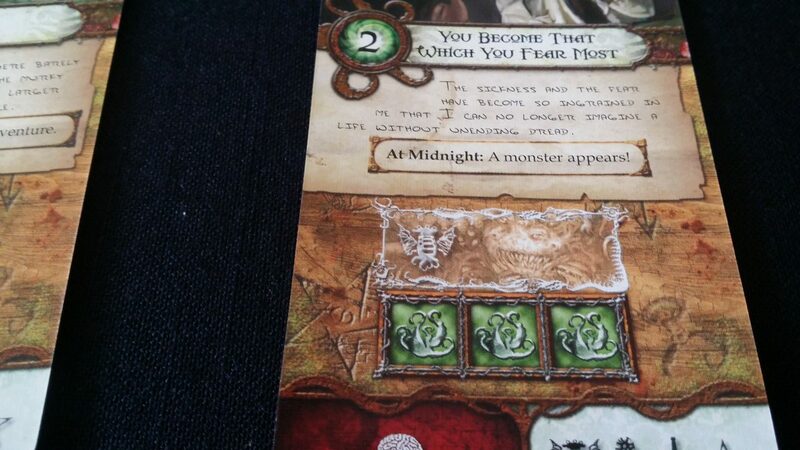 I’m not sure how you do that for Elder Sign though given how arbitrary everything is. It’s possible for players to be devoured during play, but at least the cost of this is relatively low. You lose all your accumulated resources, but you bring another investigator in to replace the one that was killed. Player elimination in other words isn’t a major problem. Since Elder Sign is a cooperative game, it does at least mean that everyone wins or everyone loses. That mitigates some of the issues of despair or challenge. As frustrating as it can get to be locked out of progress, or blocked from using the spells and items you had counted on, at least nobody is getting rich off of your misery. The game has no formal scoring mechanic other than ‘how many doom tokens there are versus how many elder signs you collected’. Score disparities can be very high, given how easily doom tokens are accumulated. Again, if it’s a crushing failure at least it’s a group failure. We’re willing to offer a tentative recommendation. If this were a competitive game we wouldn’t be willing to give even that, but the fact it’s co-operative mitigates a number of these problems. Perhaps best not to play it solo though. Many of the tokens are tiny, and easily dropped or mishandled. Many of the cards too are about a third the size of a standard playing card, while others are perhaps one and a half times that size. That irregularity of size makes card manipulation tricky at times. There’s not a lot of shuffling involved though, other than at setup, and there’s no need for secret hands of cards. If everyone knows what everyone else has, there’s no loss to game integrity. There is a lot of dice rolling, and you’re rolling a lot of dice each time. Since the game state is non-contiguous, there’s a risk that you’ll knock everything out of alignment if you’re not a little careful with how this is done. It’s best accompanied by a dice tower, a dice cup, or a dice rolling tray. You need to move your investigator from card to card to indicate movement, and there will as a result be a fair amount of reaching over the game state. However, since it’s a game with a non-contiguous state there’s no reason you can’t arrange everything in a way that is comfortable for everyone to access. You’ll accumulate a hand of resources as you go along, including spells, magic items, common items, and occasionally allies. 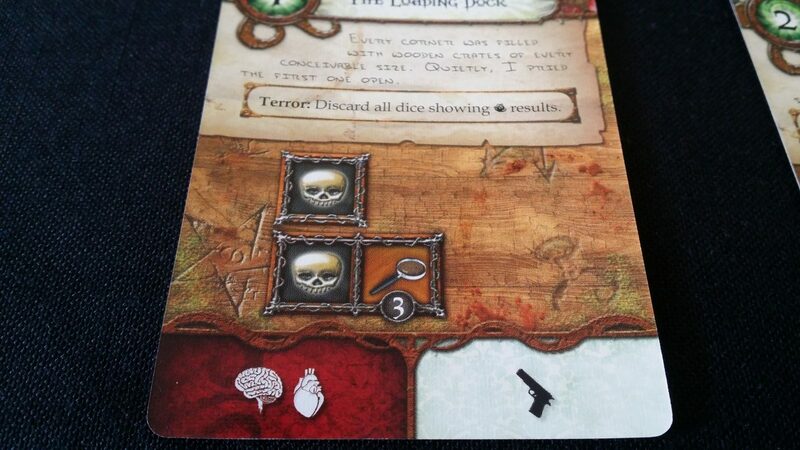 You’ll pick up clue tokens too, and have to mark wounds and sanity damage with tiny tokens. There’s a fair bit of traffic as cards are traded and exchanged, and small denomination damage tokens are exchanged for larger tokens. Drawing of monsters is supposed to happen randomly from a cup or other receptacle, which could be a problem for the more serious categories of physical impairment. However, if none of this is possible the game offers a good degree of verbal discrimination. All of the adventures have unique, and evocative names. Every adventurer has their own name, and each of the resources likewise is unambiguously titled. You won’t have a problem in issuing instructions if that’s a suitable alternative for direct engagement with the game. That’s not going to be an option in solo play of course, but it’ll work reasonably well for group play. As such, we tentatively recommend Elder Sign for those with physical impairments. There is a required reading level for play, and a need to communicate some very basic strategy throughout in group settings. There is otherwise no requirement for specific communication. As a result, it’s recommended in this category. Elder Sign has something of a troubling theme for those that may not be willing to countenance the end of all things at the hand of impassive, intolerant ancient gods. It’s never particularly overt in its horror, and throughout it tends to imply more than outright state some of the things that are going on. As vaguely comic as the cavalcade of monsters, magic and mayhem becomes in Elder Sign, I have to say it nails the sinister understatement of Lovecraft’s most effective cosmic horror. As such, the disquiet that you might feel when playing it is going to be entirely generated in your own mind as a response to contemplation of the theme. It’s not a scary game, but it is a game that constantly toys with frightening implications. Those of a sensitive disposition won’t likely find anything especially troubling in day to day play. I make no guarantees for what happens in the dead of some sleepless night. There are passages of Lovecraft I still hear reverberating around my skull when I’m gripped in Insomnia’s vice. There are sections of Elder Sign that threaten the same. On the other hand, I can imagine quite easily most people will play it without ever even giving the subtle complexity of the mythos a second thought. Or even a first one. Or a third one. I have some issues too with the use of the tired cliché of the sanity meter. This takes an absurdly reductionist view of mental health and represents it as something akin to the petrol in a car. That if you get ‘a bit insane’ you can just top up your sanity from the well of psychology. This is a convenient ludic device, but is a very insensitive and crude portrayal of a spectrum of conditions characterised primarily for their nuance. 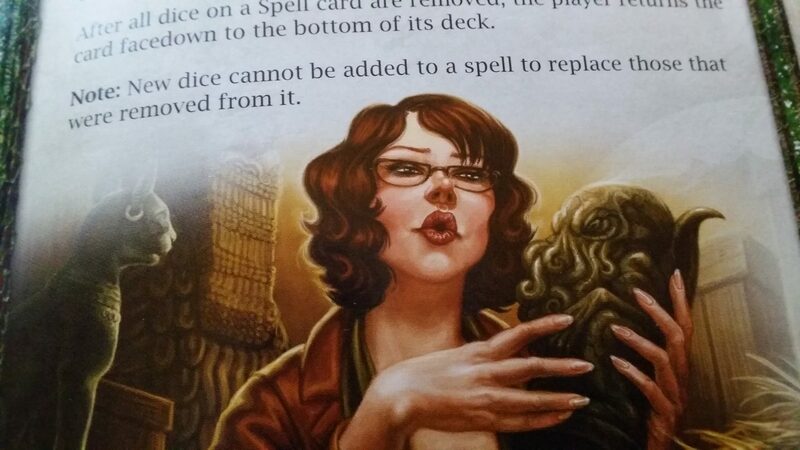 The world of Elder Sign is broadly a place for White People Only. Vincent Lee is the only character I think has any kind of nuance at all to his portrayal. Given Lovecraft’s endemic racism, this probably isn’t a surprise. Gender portrayal is somewhat even, which is nice – although there is one character (Mandy Thompson) who seems to have been drawn in a pose specifically designed to show her barely contained breasts spilling out of their constraints. The manual does default to assumed masculinity, referring to ‘his turn’ and ‘rolls his dice’ and so on. Overall though, it’s not too bad – even the box has a man and a woman on it, and both of them look like proactive bad-asses. DAMN IT SCULLY WHAT WILL IT TAKE FOR YOU TO BELIEVE ME? Cost wise, it’s a steal. It has an RRP of £25 for a game that contains a great degree of configurable replayability. It also scales well from one to eight players. That gives it, at the high end, a cost per player of just over £3.12. That’s cracking good value. Sure, I don’t like it much myself but if you do you’ll get a great deal out of the box. There are lots of cards, lots of adventures, lots of investigators, and lots of monsters. Given how each textures the game, you’ll have plenty of reasons to try it out in different combinations. We’re prepared to recommend Elder Sign in this category, although as you can tell from the discussion, with caveats. For those with visual and cognitive impairments, the need to cross-reference a lookup chart with the tasks to be completed is likely to be very taxing, especially if you don’t have the full set of eight accessible replacement dice to use. Tasks require a combination of focusing, assistance, and splitting the cost over multiple dice and there’s going to be a lot you need to keep track of to do it correctly. The tiny tokens used throughout are going to be a problem for those with visual or physical impairments, but as you can imagine the problem compounds significantly for those with both. It’s going to be almost impossible to meaningfully manipulate some of the game counters, and that’s going to make the solo game completely inaccessible. Communication impairments paired with physical impairments are often an issue, and that doesn’t change here. If both impairments must be considered in combination, the game is likely not playable. Playing time varies considerably depending on to whom you talk. The box suggests between one and two hours. I suspect the latter end of that spectrum is more typical, with an additional time consideration when accessibility compensations need to be taken into account. Conditions with symptoms that modulate in severity over the course of a day may not be very compatible with this kind of session length. Luckily the game elegantly supports dropping in and out, and even for one player to control multiple investigators. The solo game in fact is based on the idea of multi-tasking. 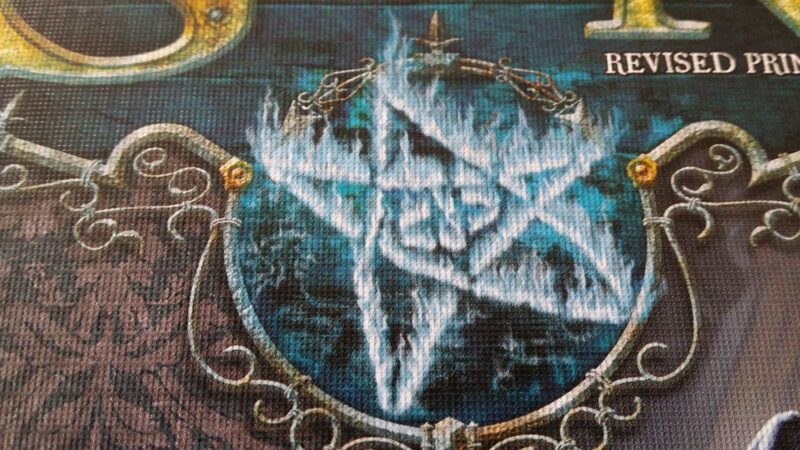 That won’t dovetail well if cognitive impairments are an issue for people remaining at the table, but in general Elder Sign offers a low-stress alternative to seeing things through to the bitter end. Elder Sign does quite well in some of the categories we traditionally see good results in – communication and socioeconomic accessibility for example. It’s also a game that doesn’t put a lot of stress on memory – everything you need is in front of you. We have a less positive story for everything else. At best, we offer tentative recommendations for colour blindness, visual impairment, physical accessibility and emotiveness. All of these though are based on the assumption you’re not considering the game for solo play. We are expecting you’ll have someone available to deal with whatever issues that come along. We advise you stay away if fluid intelligence, or visual impairments must be considered. It might seem strange given how simple the game is that we have rated it so low in the fluid intelligence category. While you don’t make very many complex decisions, you need to navigate a broad spectrum of conditional effects with every action. Every conditional consideration adds a cognitive burden, and there gets to a point where simple accumulation tips over into inaccessibility. We gave Elder Sign 2.5 stars in our review. It’s fine – we don’t dislike it, but we won’t go out of our way to play it either. It does offer an easy to set up alternative to some of the heavier, meatier Cthulhu games, so it does perhaps fill a niche. As such, hopefully this teardown will give you the information you need to make an informed decision on whether it’s something you could realistically expect to play.